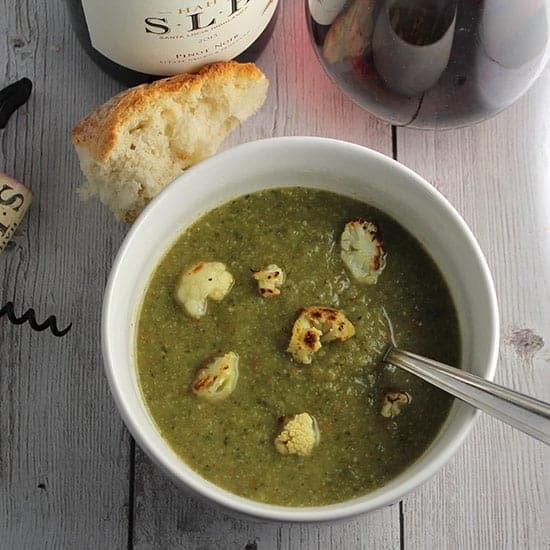 Roasted Cauliflower Kale Soup paired with a Pinot Noir would make a great start to a Valentine’s Day dinner, and is also hearty enough to be enjoyed as the main course for a weeknight supper. We received a complimentary sample bottle of the Hahn Santa Lucia Highlands Pinot Noir. As always, the opinions here are my own. 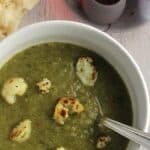 We enjoyed this Roasted Cauliflower Kale Soup for a weeknight supper recently, but I had Valentine’s Day in mind when I came up with the recipe. I had received a few bottles of wine to sample as potential options to recommend for Valentine’s Day, and wanted to come up with something to pair with the 2013 Hahn Santa Lucia Highlands Pinot Noir. Sure, there can be some decadence involved with a Valentine’s Day dinner. But all the hearts associated with the day tend to get me thinking about healthy food. We want those we love to be with us and healthy for a long time, right? So I thought I’d serve up a vegetarian soup recipe packed with nutritious kale and cauliflower. 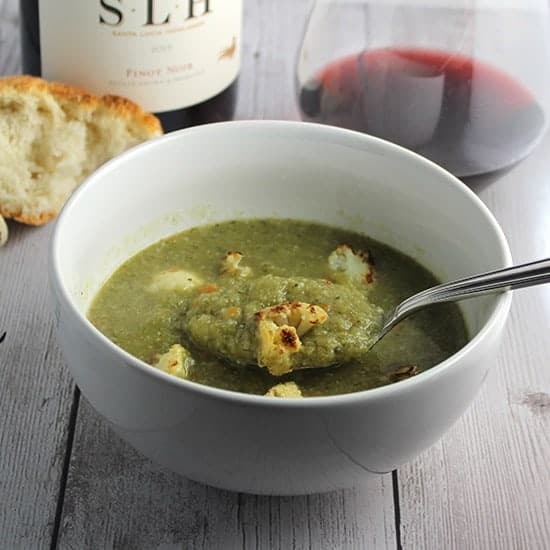 This Roasted Cauliflower Kale Soup would make an excellent first course for Valentine’s Day, paired with the Pinot. It definitely has the substance to be a full meal, too, especially served with some good crusty bread. A full meal that’d leave room for that Valentine’s Day dessert, of course! I love the deep flavors you get when roasting vegetables. Roasting veggies is a great first step to some flavorful soups. As the cauliflower roasts, the other veggies involved in this cauliflower kale soup simmer on the stove top, making for a pretty efficient process. Most of the roasted cauliflower gets added into the soup pot and pureed toward the end of the process, but you save enough of the cauliflower to add as a topping. This makes for a great presentation, fit for Valentine’s Day or other special meal. An immersion blender is so handy for pureeing soups to get a nice, even consistency. You can transfer the soup to a food processor and puree in batches if you don’t have an immersion blender. But if you like thick, creamy soups (without necessarily adding cream), I highly recommend getting an an immersion blender, so am including an Amazon link for your convenience. 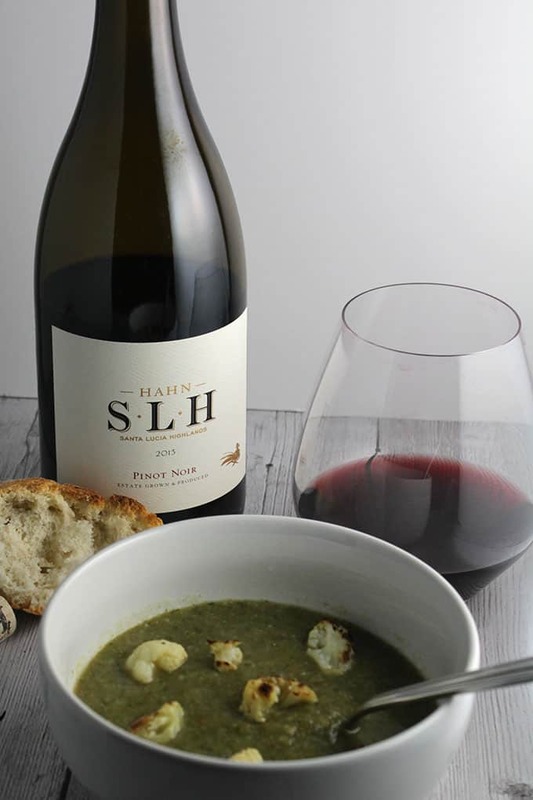 As noted earlier, I paired the 2013 Hahn Santa Lucia Highlands Pinot Noir ($30, 14.5% ABV) with this soup recipe. I was eager to try this Pinot, as we enjoy the entry level Hahn Pinot on a regular basis but hadn’t tried this bottle. The wine is sourced from 3 vineyards in the Santa Lucia Highlands, a California appellation in Monterey County. More information can be found on the Hahn website. I get subtle fragrance of violets on the nose. Taste of raspberry fruit, with notes of vanilla and hazelnut, and a bit of slate. Pleasant mouthfeel, which definitely is a plus when pairing the wine with the fruit. The flavors of the soup are subtle, creating a good backdrop for appreciating the taste of the wine. The earthiness of Pinot Noir marries well with the roasted cauliflower and spice notes of the soup. This would definitely be a good pairing to enjoy with your Valentine! 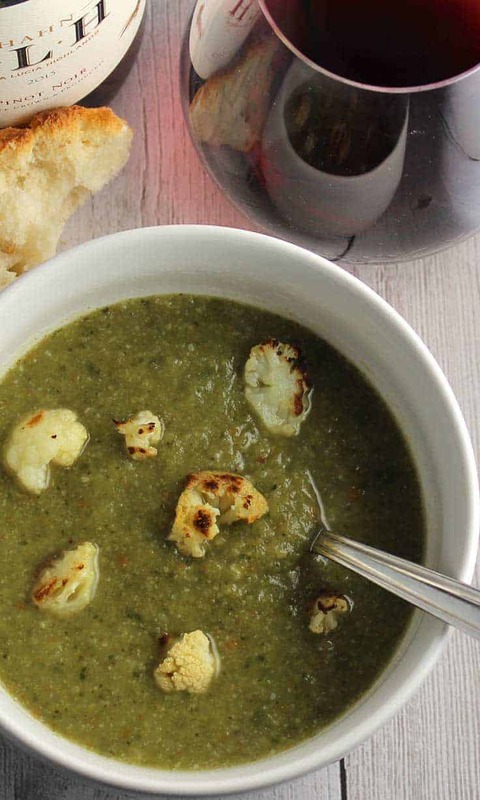 Roasted cauliflower combined with kale for a tasty and healthy vegetarian soup. Preheat oven to 400. In a roasting pan, toss the cauliflower with 2 tablespoons olive oil, garlic powder and a pinch of salt. Place the cauliflower in the oven and roast for approximately 20 minutes, until the cauliflower begins to brown and soften. Remove from oven when done and set aside. As the cauliflower roasts, start making the soup on the stovetop. Heat the remaining tablespoon of olive oil in a soup pot. Add the leeks, and sauté on medium heat for 5 minutes. Add the carrot, potato and garlic to the pot, and cook for a few more minutes. Add the vegetable broth and water to the pot. Stir in the kale, and simmer the vegetables for 25 minutes or until so until softened. Reserve about 3/4 cups of the roasted cauliflower. Add the remaining cauliflower to the soup pot, and simmer for another 5 minutes. Remove the soup from the heat, and puree with an immersion blender. If an immersion blender isn’t available, transfer in batches to puree in a food processor. Add the cumin, sage, paprika, cinnamon, salt and pepper to the pureed soup. Heat for another 5 minutes to let the flavors meld. Ladle the soup into bowls, topping each bowl with a few florets of roasted cauliflower and a sprinkling of cheese. Pass additional cheese at the table. Serve with a crusty bread and a Pinot Noir, if you are so inclined. Enjoy! An immersion blender is ideal for puréeing the soup. Alternatively, you can transfer the soup in batches to a food processor to puree. Tool and Resources: This post contains Amazon affiliate links for products I recommend related to the article, which means I earn a commission if you choose to purchase using these links. Thanks for the recipe David. Bumper crop of cauliflower put up in the freezer so we are glad for more cauliflower recipes. Thanks Jade. And that gives me an idea, hadn’t thought about freezing cauliflower! Wonderful color to this soup, too! Can’t believe you got all that color out of 2 kale leaves! Mike loves his immersion blender. He uses it all the time. I had that Hahn SLH Pinot also, and we thought it was absolutely amazing! It was one of those wines we were upset when the bottle was empty!